Headbutt specialist Zinedine Zidane has denied being the driving force behind the France World Cup team's decision to challenge manager Raymond Domenech's authority. 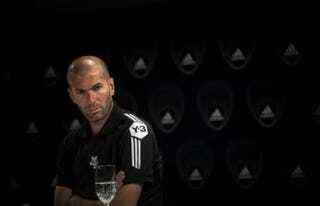 The French legend openly criticised Domenech last Tuesday, saying "[he] is not a coach. There is no teamwork." Two days later it was alleged Zidane had spoken to senior members of the squad before the Mexico game, suggesting they convince American Pie dad to switch from 4-2-3-1 to 4-4-2, and drop Yoann Gourcuff and Sidney Govou for Thierry Henry and Matthieu Valbuena. Domenech was reportedly willing to go ahead with the changes… until he found out they were ZZ's idea. "Thinking that I can call the players to put pressure on the coach four years after I have retired is serious." He added: "I never had a problem with [Domenech] but I never had a good feeling for him. But I respected his instructions. As captain, I was talking, but he was the coach and I respected the rules. "I am against the fact that Les Bleus do not train - but I'm not inside group. That's why it's better for me to be quiet," he added. Considering a) his position has been weakened from every angle for years, and b) he hasn't given a toss about his job security for months, the FFF allowing Domenech to coach France through this World Cup is fast becoming number one contender for the worst decision in the history of international football.